Card of the Day ~Pray~ Sometimes Indigos don’t realize how powerful their thoughts and words are. This card reminds you to pray and think positively, because negative thoughts and words con actually block you from living your purpose and dreams. This is especially true if deep down you believe you don’t deserve what you want or that achieving it is unrealistic. When you pray, you shift your focus and energy away from what’s not working and align yourself with God and the angels. This connects you with your higher self, which knows that nothing is impossible. Prayer is an opportunity to lift your vibration higher to the place of wholeness and healing. The next time you’re worried, take a few moments to say a prayer and trust that you are exactly where you’re meant to be. 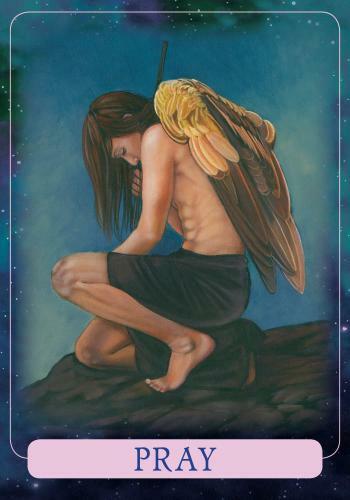 You’ll then feel the power of the angels surrounding and uplifting you to guide and direct your path. I know with all my heart prayer works. No matter what is going on in your life God and the Angels are always with you. You can turn to them at anytime and anywhere. Have a most magnificent day. I love you all!